Have you read it? If not, you absolutely need to read this book. The quote applies to this book in more ways than you can imagine. The Husband’s Secret is a book about lies, life changing secrets and moral dilemma’s. It isn’t about one secret, but many and one is horrific, and not what you expect. The story weaves through 6 families and each one is unraveling. They are coming apart at the seams for different reasons, but each family will intersect with the other in ways you won’t see coming. When one huge secret is revealed, life takes a turn and spins out of control. Choices are made without thinking of the consequences. If you find yourself in Cecilia’s life, where she discovers this incredibly tragic secret, would you keep the secret for someone you love, would you look the other way, and could you forgive? That is the big question. Liane Moriarty’s story is brilliant. I felt as though I was standing on the sidelines watching the characters and hearing their conversations. The story came to life for me. I am passionate about this book and hoping you will read it. The story will stick with me for a very long time. When faced with the same situations, you think about how you would react. What part of yourself are you willing to give up to protect and love someone. The character’s are likeable, and you may feel like you would be friends with them. Put yourself in their position, faced with the same moral dilemma, you may make a different choice in how to the secret, but you respect the choice they make. This book is on the top of my all time favorites list. I couldn’t put this book down. Chores were left undone and I didn’t care, I just wanted to read and get to the end, but at the same time I didn’t want it to end. The Husband’s Secret is a must read and I hope you will love it as much as I did. I promise it will keep you talking to your friends about it for a while. If you are looking for Book Club ideas, read on. The book is set in Australia. If you are serving dinner any authentic Australian dish would work perfectly. Maybe even a taste of Vegemite. If you happen to live in Orange County, CA, there is an Australian eatery, Pie Knot. Located in Costa Mesa, they serve Australian pies and would be great for dinner. You can find them at www.pieknot.com. In the book, a small part of the story involves the Easter holiday. The tradition at Easter is for Hot Cross Buns, served with lots of butter and a pot of steaming hot tea. This book is going to bring about some lively discussions, so I am going to do just dessert at the meeting. Hot Cross Buns and tea with a little Australian wine will work well. I want time to discuss the book. 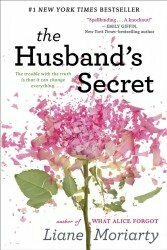 Kathryn Cope has written The Husband’s Secret: A Guide for book Clubs. You can find this on Amazon. I hope you will come back and leave me a comment on what you thought about The Husband’s Secret. Is this more of a “women’s” book than for a man? Did your husband read it? Bob, I think women prefer it. But I think you might like it. Tony hasn’t read it, but asked me to loan it to him on his Kindle. What happens in this book really applies to both men and women. Let me know if you read it and what you think.